Richard Biever has dedicated himself to the craft of theater. Biever’s latest endeavor, FUSE Productions, is a product of his decades of knowledge and experience as an actor, director, composer, lyricist, and music director. Biever has been well-schooled in theater, attending the American Academy of Dramatic Arts in New York City and receiving a bachelor of music education degree from the Jacobs School of Music at Indiana University. 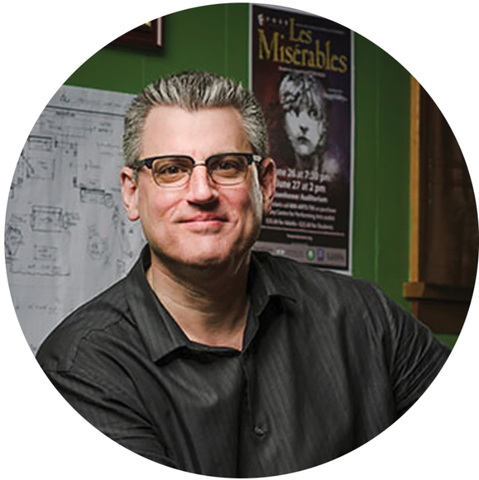 He began in professional productions at age 16 near his home in Nappanee, Indiana, then directed a production of Little Shop of Horrors while in college. He became the resident music director at Circa 21 Playhouse in Rock Island, Illinois, as well as the Downtown Cabaret in Bridgeport, Connecticut. FUSE Productions was created in July 2013 as the resident theater company for The State Theatre, where Biever was the executive and artistic director at the time. As the project was blossoming, Biever made sure to keep local ties within his crew. “The idea was to combine, or fuse together, local actors, Penn State students, professors, and professional actors to create quality and professional theater here,” Biever says. When the board of The State Theatre restructured its management, Biever left his position to make FUSE an independent theater company. Being an independent creator is nothing new for Biever, though. Working in Boston in September 2001 when the 9/11 attacks occurred in the nation, he was inspired to create a musical tribute called The New Normal: A Spiritual Response in Words and Music. The musical played to more than 1,500 attendees at Boston’s Christian Science Center on September 11, 2002. Following his experiences in Boston, Biever re-opened a musical theater studio, Singing Onstage, with his wife, Heidi, in State College. The independent venture brought great success, as Singing Onstage now produces eight shows each semester with 150 students from ages 4-18 participating. During this time, Biever also completed his MFA in directing with mentor Susan H. Schulman. Biever expanded the Singing Onstage brand to create a musical theater development company, Singing Onstage Productions, in New York City. Through the company, he was able to direct two new musicals, Harmony, Kansas and Nightfall. Having success in multiple independent ventures, Biever then set out to make FUSE work as a local State College company. In four seasons of shows, FUSE has continued to grow through the creation of hardly-seen productions. Its recent production of The Hunchback of Notre Dame was the company’s highest-selling show thus far. One example was the production of the racially and religiously charged musical Parade, which Biever calls a “scary” proposition. After the production was over, though, Biever knew he had made the right choice in highlighting the more unseen treasures of theater. The upcoming FUSE season, beginning September 13, highlights musicals that while not well-known, have special value to Biever and his company. From September 13-15, FUSE presents Chess: The Musical, featuring music from Benny Andersson and Björn Ulvaeus of the pop group ABBA and lyrics by Tim Rice. The musical is based around a chess tournament during the Cold War-era, which turns into a love triangle between two chess masters and a woman. Another production being prepared by FUSE, planned for February, is Sunday in the Park with George, with music and lyrics by Stephen Sondheim. FUSE also plans a performance of Jesus Christ Superstar next June as part of its 2018-19 season. Having been involved with many projects in the State College area over the years, Biever is able to use his years of theater instincts to train future star actors and actresses. He has learned a few things himself while on the job at FUSE, working with and picking up tips from current Penn State students, theater professors, and professionals both in and outside of the area. For more information on FUSE Productions’ 2018-19 season, visit fuseproductions.org or call (814) 380-8672.